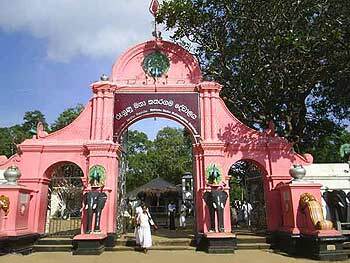 Entrance to Ruhunu Maha Kataragama Devalaya of Lord Kataragama Skanda. Service at Kataragama begins with puja to the god's elephant-headed brother Ganapati whose temple is adjacent to god Skanda's temple. 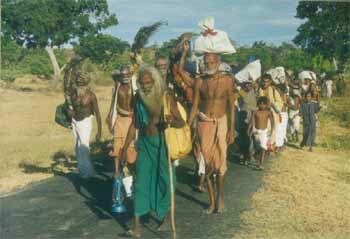 Pada Yatra devotees from the North and East walk barefoot for weeks to reach Kataragama during the annual Esala festival. Some devotees walk on burning embers to fulfill vows made to Lord Kataragama. 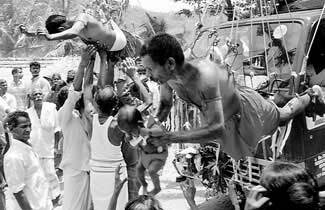 Penances from the mildest to the most extreme are common at Kataragama. Kataragama is a common place of worship for both Buddhists and Hindus. Hindu devotees fill the precincts of the Kataragama devale to participate in the numerous offerings and seek the protection of God Skanda, to whom the devale has been dedicated. Buddhists too partake in the 'poojas' offering 'pooja vatti' – mainly filled with fruits, and also conduct their own devotions at the Bo tree and the temple within the devale premises. There has always been a close relationship between Buddhist and Hindu faiths to the extent that in most Buddhist temples in Sri Lanka, there are also devales dedicated to different deities. Close to the Kataragama devale is Kiri Vehera, the imposing stupa built in the 1st century B.C., which the Buddhists venerate as one of the sixteen places in Sri Lanka visited by the Buddha. According to the legend, King Dutugemunu (161 – 137 B.C. ), who unified the country having won the war with Elara, the South Indian king ruling in Anuradhapura, was the first patron of Kataragama. It is said that he had made a vow to construct a shrine in honour of God Skanda if he succeeded in winning the war against the South Indian invaders. He kept to his promise and built the shrine which then dates back to the 2nd century B.C. God Skanda is considered Sri Lanka's guardian deity and is identified as one who can bring prosperity and protection. As he is described in the popular Sinhala verse – 'Muhunu sayaki – ath dolasaki – Mayura pita vāhane' – meaning he possesses six faces and twelve hands and his vehicle is the peacock. He is depicted in this form in paintings and drawings. 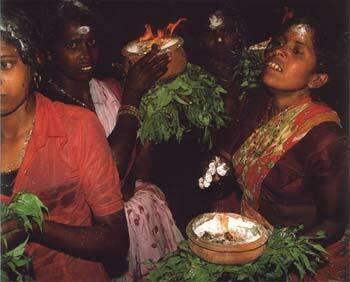 The offerings to the deity can be made at specific times during which the religious observances are conducted. Devotees gather in numbers with the baskets of fruits in their hands to be handed over to the 'kapurala' (he is addressed as 'kapu mahattaya') – the lay official in charge – and his assistants all clad in white. The offerings are taken inside and a portion is returned for the devotee to consume. The 'kapurala' applies ash on the forehead of each devotee who also picks up a little coconut oil from the tall brass lamps and applies on the head. Many believe this oil helps to cure illnesses. Many, in fact, collect the oil into small bottles to take home for use later. 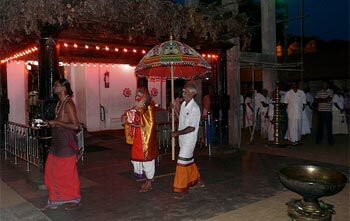 Kataragama is one place where the devotees observe strict discipline. This is possibly because in the old days, it was an arduous journey. The area in and around was jungle. Wild animals roamed the countryside. There were hardly any proper roads. Most devotees walked the distance. In fact, one could not be certain whether he would return home safely. The saying went 'Denagena giyoth Kataragama – Nodena giyoth ataramaga'. (If you know the way you will reach Kataragama – if not, you will be stranded). The result was that devotees developed a feeling of fear. To get over this fear, the 'nade gura' (head of the pilgrim party) would lay down some strict guidelines. Abstain from eating fish or meat. Be strict vegetarians. Alcohol is forbidden. Above all, guard your tongue – you are going to the 'deviyange rata' – land of the gods. Beware! This code of conduct is followed to this day. Once you reach Kataragama, all the devotees are advised to take a dip in the Menik Ganga which flows alongside the shrine and cleanse themselves. They then proceed to the devale clad in white clothes. As you enter the devale premises, it is a common practice to break a coconut on a stone fixed on the soil for the purpose. 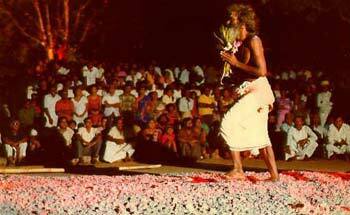 Fire-walking is one of the highlights during the Kataragama festival. Hindu devotees perform the act. They walk on a pile of logs which keep burning for around two hours when the embers are evenly spread out to cover an area of around three to four metres in length and about two metres in breadth. Some tend to run or hop along but others walk leisurely to prove that their feet don't get burnt. Often this is to fulfill a vow. Mild or extreme forms of penance are commonly at Kataragama. 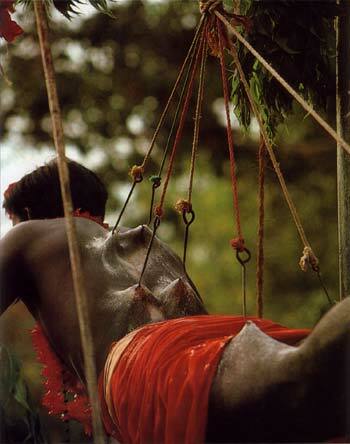 It is a common sight to see devotees with silver needles piercing their cheeks and tongue. Some can be seen with a cobra made of silver foil protruding from the mouth. There are others with small silver spears pierced through the skin in the upper portion of the body. This is in addition to small hooks. Another form of penance is walking on nail hooks. A not so common sight is a pilgrim hanging on a tall scaffold with eight hooks. The scaffold is made of iron poles and fixed in the shape of two triangles, one placed on top of the other so as to form a diagram of Skanda.